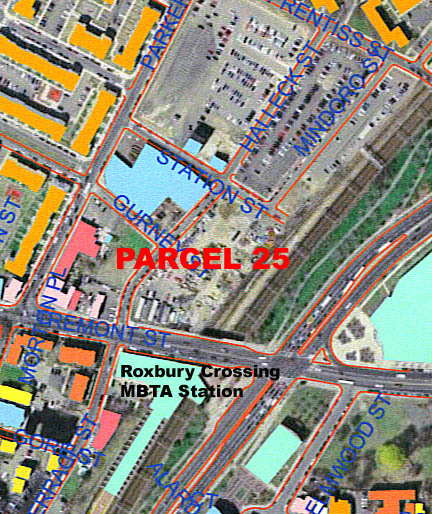 Parcel 25 is located at the intersection of Columbus Avenue, Tremont Street and Gurney Street, across from the Roxbury Crossing T stop. The site is currently owned by the MBTA. The City of Boston and the State of Massachusetts have recently signed a Memorandum of Agreement stating that the disposition agent for the property will be the Boston Redevelopment Authority. The two DND lots owned by the City and the lots owned by Wentworth Institute of Technologywill also be a part of our community planning initiative. MHNHS is implementing the Parcel 25 Community Planning and Development Initiative to create a redevelopment vision for a major 2 acre vacant parcel at Roxbury Crossing. This redevelopment vision will be the catalyst to solidify Roxbury Crossing as a viable neighborhood center and entrance to the Mission Hill community. 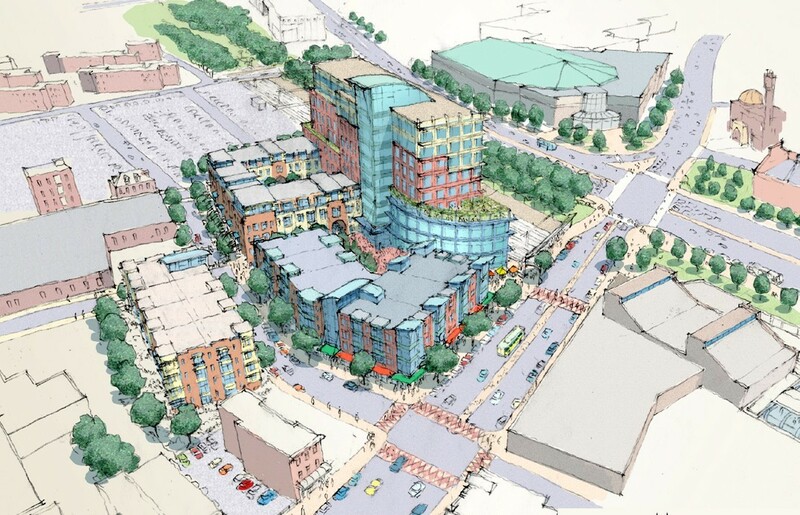 The Parcel 25 Community Planning and Development Initiative is modeled after the extremely successful planning process implemented by MHNHS to create the development vision for One Brigham Circle. The Parcel 25 process will use the same tools and methods of organizing, resident participation and community planning. MHNHS began the Parcel 25 Community Planning and Development Initiatve in 2004 with the goal of generating the community’s vision for a viable development plan for this gateway parcel. MHNHS staff and Board members reached out first to residents and busineses in the Roxbury Crossing area to see if there was interest in focusing on this important but neglected site. Hearing a strong desire to improve and develop this parcel, MHNHS began conducting Small Group Brainstorming Meetings through June of 2005. These meetings involved abutters, stakeholders, youth and residents of the various districts of Mission Hill. Over 140 Mission Hill neighbors attended 14 brainstorming sessions identifying potential goals, uses, and constraints on development. The ideas generated in the Small Group Brainstorming Meetings are in the links below. The second stage of the community planning process began last fall of 2005 . Volunteers recruited at abutter and district meetings began serving on Citizen Task Forces and gathering information on transit oriented development, housing, and the 3Es — easements, egress, and existing site conditions. Community Workshops began in February 2006 with over 120 residents and nearby businesses participating. MHNHS hired a design firm, financial consultant and planning facilitator to work with the community at 4 to 5 day-long workshops to develop consensus for the community’s vision, refine schematic drawings, and discuss and analyse the feasibility of community preferred options. The program will reestablish Roxbury Crossing as a lively retail area with viable businesses, establishing a positive Gateway to Mission Hill. It will have a positive economic impact for Mission Hill including job training, homeownership, employment opportunities, and stabilizing retail. It will be community controlled and neighborhood-serving. The vision includes 8 -12 new neighborhood-serving retail stores and restaurants that will be smaller in size, transit oriented, and subsidized by the development to ensure viability in this emerging market area. The program includes the re-creation of housing along Gurney Street and above retail along Tremont Street with desired affordable homeownership opportunities as well as rental housing for low-income seniors. The development will be pedestrian-friendly improving the traffic flow along Tremont and providing for significant streetscape improvements including trees, improved sidewalks, a planted median strip, significant and symbolic crosswalks, and pedestrian pathways through the project connecting the Roxbury Crossing T stop to housing at the site and residential areas of Mission Main and Alice Taylor. It will be transit – oriented providing safe access to the bus, the train and encouraging the use of bikes and zip car. Design and uses will allow Parcel 25 to be a place that connect the community. It will be a place where families and seniors live, a place for people to live and work, a place that is multi-cultural and multi-aged, serving senior citizens and youth, reflecting and open to the entire Mission Hill community. The signature community building on Tremont Street will include nonprofit office and training space and multi-function rooms for many community activities from dance rehearsals to family baby showers. There will be sustainable design including green roofs and energy efficiency for both homeowners and business owners. The design will be respectful. The four story buildings along Tremont, Gurney and Station fit in contextually with the surrounding area. The mix of uses will replace the illegal and unattractive uses that take place in the area now with positive uses that will provide people and activity, security and lighting. The economic engine of the project – the office component – will bring other solutions beyond the financial. The height of the project is in one building along the orange line reflecting the need for a strong face to Tremont/Columbus. It will also buffer the residential and retail uses from the tracks. The office building design allows for the MBTA easement areas to remain open and accessible while allowing services to the site. The use will bring other patrons to the retail and will further support the community’s transit oriented development goals bringing workers to the area easily accessible to the rapid transit line.